Cubancards.com is easy-to-navigate and has many distinctive sections and features. It was put together to honor Cuban baseball and players and facilitate the sale of the rare, limited-edition 1994 Serie Selective league baseball cards -- officially sanctioned by the Cuban Amateur Baseball Federation. These cards include a mixture of contemporary stars, including Eduardo Paret, Ariel Pestano, Pedro Luis Lazo, Yovani Aragon, Carlos Tabares, Enrique Diaz, and Juan Carlos Moreno; retired Cuban greats including Omar Linares, German Mesa, Antonio Pacheco, Orestes Kindelan, Luis Ulacia, Adiel Palma and Javier Mendez; and noted defectors, including Orlando "El Duke" Hernandez, Livan Hernandez, Rolando Arrojo, Vladimir Nuñez and Osvaldo Fernandez. You can order the cards online by using your VISA card, or by mailing us a money order or certified cheque..
E-mail us or call our toll free line (800-987-3472) in North America to leave an inquiry. 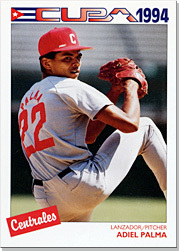 Browse our website for information on these rare cards and click on our photo galleries for information on great Cuban players in the 1994 set. Share information on our ¡Esquina Caliente! 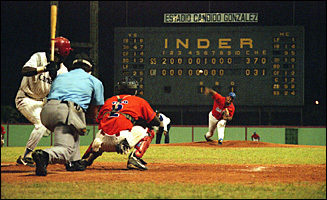 message board and swap stories about Cuban players, Cuban baseball and your experience in following the players from this great baseball-playing nation. Check out our photo galleries, mostly with exclusive photos, of Cuban baseball players and life. We offer Cuban baseball fans around the world, a home to visit and link with information on Cuba's national sport and favorite pastime! Omar Linares, here in his prime, is considered by many to be the best Cuban player in the last 40 years. Sancti Spirtus pitching ace Yovani Aragon on the mound at Candido Gonzalez field in Camaguey. Visit "Other Interesting LINKS" to discover more about Cuban baseball and the other sources of information that are out there on the world wide web. Follow our site map for an easy rundown on this website - one of the very few comprehensive websites in the world on Cuban baseball!! When you purchase a product from Cubancards.com, you'll get on our e-mail list for news on future products. You'll love Cuban baseball as much as we do!! ¡VIVA LA PELOTA CUBANA! ¡VIVA CUBA! 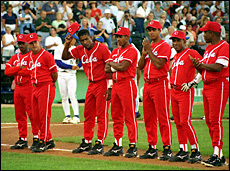 Some Team Cuba members in ’99 (l.-r.) German Mesa, Juan Padilla, Yobal Dueñas, Roberquis Videaux, Ciro Silvino Licea, Luis Ulacia and Jose Ibar.